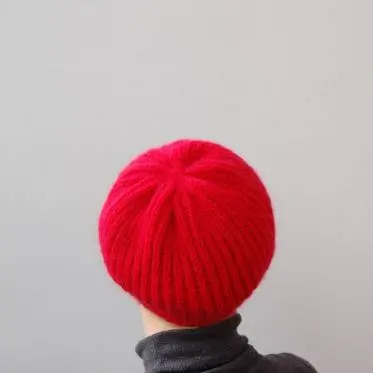 This simple and zingy beret is extremely easy and quick to make. It will cheer up the dullest winter’s day. 55g (200yds or 182m) of Jade Sapphire 4-ply Mongolian Cashmere KEJA in red (col.C14), or your chosen colour. • 24 sts & 50 rows = 10cm/4” over 1 x 1 rib, using 2.5mm needles. • 16 sts & 48 rows (24 long knit sts) = 10cm/4” over brioche rib, using 4.5mm needles. All Rs: *K1, p1; rep from * to end. Rnd1: *yo, sl1, p1; rep from * to end. Rnd2: *k2tog, yo, sl1; rep from * to end. Rnd3: *yo, sl1, p2tog; rep from * to end. Rep rnds 2 & 3. One. A key is provided to allow for adjusing the size.